Hi, can you please post a photo of the engine bay? Id like to know which Full-Race kit are you using, if its the small runner Air Conditioning twinscroll manifold? What about the downpipe is it the Non-Aircon 3" ? This setup looks nice, I'm also thinking of the EFR 8374 turbo on my Evo x. The only problem is the spooling. And what have u done to urs transmission to handle the torque with the 2.4 engine?? what crank are you using for your build? Way to go English Racing! good comparison. it looks like it lost 100ft/lbs at 4200rpm. 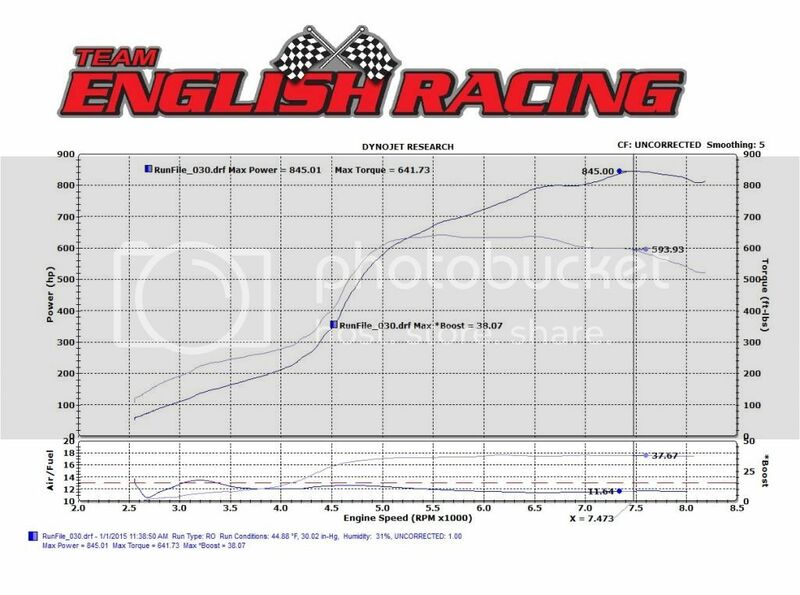 and the tq rise it takes to go from 200tq to 300tq doubled from 500rpm to 1000rpm. those are definitely losses you can feel. then the power gain from 5000-7000rpm is only 40-50hp. the high rpm power gains are nice, but I dont see how you can say the 1.45 was needed. the tq curve shapes are nearly identical. looks like the 1.05 on the smaller snail was doing quite well. overall I like the power curve of the 8374. the 9180 in this case looks too much like on and off switch. You dont really feel it on the street. It happens so fast that if anything it has more traction now and the car is faster. Backpressure is the main reason you do the 1.45, decrease EMAP save the motor. thanks uvambo gotta update your signature now I order 9180 EFR with 1.45AR like yours from FR but 3" downpipe from FR it is much better for power and no exhaust restriction if you do not need aircon. 1.45 ar housing but still 3in downpipe? I am thinking of moving up to a 9180 from my 8374 also but I thought the power difference would have been greater. What shaft speeds were you running with the 8374? Yea keep in mind it's dumped at test pipe too so that 3 inch is not the restriction it might seem. It's more turbine wheel size at this point. Let's just say above recommend levels.. On shaft speed. Geoff said he thinks we are out of compressor and quite possibly header volume. He doesnt think its necessarily the turbine wheel. Geoff Raicer- good work gents! however i saw this comment "It could make a little more power with timing most likely, but backpressure exceeds 1:1 at 40psi with the 1.45 even. Turbine wheel size is the likely culprit." What was the max turbo shaft speed? I believe compressor wheel could be out of flow causing backpressure to ramp up, more likely than turbine wheel. Last edited by JohnBradley; Jan 9, 2015 at 09:07 AM. Higher boost only yielded more backpressure and no additional power on this setup, and shaftspeed was close to being maxxed. Like the last EFR on this car the dyno only tells half the story. On the street the car doesnt feel any different than the 8374, probably the most responsive 850whp 4 cylinder I have ever driven. The tune is a little conservative since the car is being purposed for roll race events more than drag racing or anything short pull. The video will be up in the near future. Can you please show the graph with time in seconds on the x-axis instead of RPM? You can pm it to me if you prefer. It could make a little more power with timing most likely, but backpressure exceeds 1:1 at 40psi with the 1.45 even. Turbine wheel size is the likely culprit. I agree, though the PTE and Garrett options aren't really efficient up there either, everybody just runs them there without care of where they are on the map for either lack of a speed reference(garrett and PTE) or comp map(PTE&FP). When you say small runner, is this a 1.25" schedule 10 manifold? If so, that is fantastic power levels for that cross section of primaries. Hot dog! Have you got any video footage m8?? ?